BANGKOK, Oct. 26, 2018 /PRNewswire/ — This is the first time the world has witnessed a facial cleanser which has the ability to reduce wrinkles, an incredible two-in-one product guaranteed by the Best Facial Cleansing Oil Award from OK! BEAUTY CHOICE 2018 in Thailand. 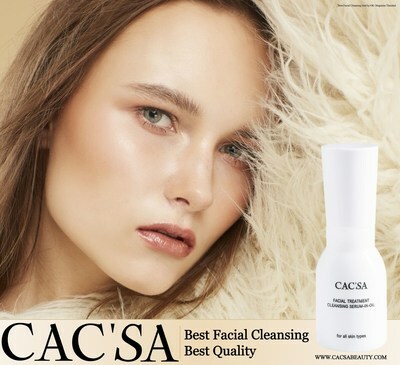 CAC’SA Facial Treatment Cleansing Serum-In-Oil comes with the cutting-edge anti-wrinkle innovation "SWT-7" that combines two best extracts from Swertia Chirata from the Himalayas in India. SWT-7 won a Silver Award from the 2015 in-cosmetics Global that took place in Spain and is known for its natural ingredients capable of stimulating keratinocyte proliferation to regenerate thin epidermis, particularly around wrinkled skin. This innovation leads to significantly reduced wrinkles, more tightened skin, and a younger facial expression. Besides, CAC’SA Facial Treatment Cleansing Serum-In-Oil contains Argan oil as a major ingredient – an organic product extracted from the kernels of the Argan tree, which is native to Morocco. The Argan oil not only removes makeup but also cleanses your face of any impurities, and as it is high in vitamin E, it serves as an effective antioxidant and helps to repair damaged skin, preventing it from dryness and irritation and nourishing your skin at the first touch. This product is a collection of revolutionary innovations that bring together anti-aging, anti-wrinkle, nourishing and regenerating effects all in one drop to make your skin glow and look younger after regular use. CAC’SA invites you to experience this next-level product for facial wash available in a 30-ml package priced at $43. For further information, please visit: www.cacsabeauty.com or www.facebook.com/cacsabeauty.